Rural Route 5 is a rockin’ country band out of Western Wisconsin. The band brings the party every time they play and leave you wanting more and more. Nobody ever sees this band just once. Rural Route 5 came together when two band members – Tanya Dean (vocals) and Tony Zdroik (bass guitar) – played together as part of a worship team at Faith Community Church in New Richmond. After being able to balance family, career and music; the band kicked off to a packed house at The Space for Creativity in New Richmond in May of 2013. Thereafter, the band has played well over 100 gigs at private events, weddings, summer festivals, and favorite watering holes all over Western Wisconsin. For 2019, Rural Route 5 will also feature Roger Rineck (rhythm guitar), Mike Dougherty (lead guitar and vocals), Jim Saliny (fiddle) and Todd Sinz (drums and vocals). 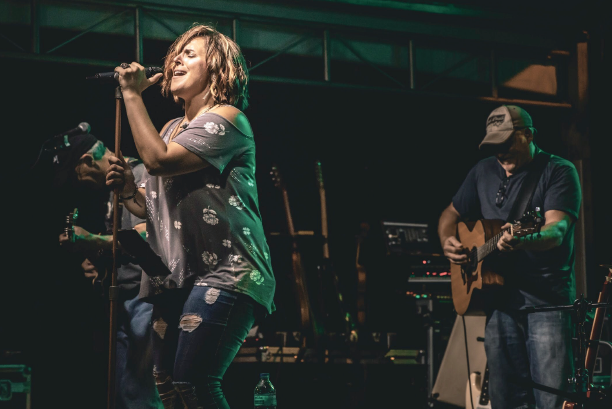 Lead by the soulful voice of Tanya Dean, the band covers a wide range of country music – everything from the Judds and Reba to Miranda Lambert and Carrie Underwood. Throw in some Garth, Charlie Daniels, and Jason Aldean … you get where we are coming from. And yes, we do have some Merle. Great, great stuff. The party does not stop with Tanya Dean. The sweet and sometimes screamin’ guitar solos of Mike Dougherty will bring out the “we’re not worthy” in you. Mike has been playing guitar for decades and leads like no other. He is backed by the solid rhythm of Tony Zdroik and Roger Rineck. Todd Sinz pounds away at the drums to keep it all locked in and steady. Then, of course, there is the fiddle. When Jim Saliny breaks out his fiddle, IT IS ON! This is not just a good local band, but a great band with fun, passionate musicians who will rock your night way. Come join the party with us. Thanks. RR5.